When working with children below 6 I like to make the dry white ball first myself. It saves time and gives the children a better base for their work which hopefully means that they have good success. Holding a length of roving in my hand I tie a knot at one end. Then I wrap the roving around the knot as tightly as I possibly can. When I reach the end I lightly needlefelt it to secure. I keep adding white wool until the ball is a bit bigger than a baseball. Children between 6 -8 can usually do this step successfully themselves. The caution here is that they will likely wrap more loosely so the ball will need to be larger and it will take much more time to get to the next step. Sometimes when I am preparing the balls in advance I wrap the wool around a treasure such as a pretty rock. If so I make the balls much smaller and use just enough wool to create a round ball through which the treasure cannot be felt. The treasure should be a minimum of 2" in diameter though it does not need to be round. You can fudge that with the wrapping. At the end I cut them open to reveal the nugget within to much oohing and aahhing from the children. Once the basic ball is made, either in advance by me or in class by the kids, I let them add colour in whatever way pleases them. I encourage them to use the colour to make their ball look like a marble. I do try to discourage 'pictures' as the wool will likely migrate some during the process and kids are very disappointed then with the results if they had a tree and a cat which turn into a green bit and gray bit. In any case be sure to emphasize beforehand that wool has a mind of it's own and the colours may decide they need to be different while they are felting. Colour can be added by wrapping only or the children can use a felting needle to lightly secure their choices. Or an adult or two can do that for them. Depending on the size of the class you may need some extra helpers for this by the way. Some teachers feel that the felting needle is not pedagogically appropriate for children of this age. Others feel that like the sewing needle children should use 'real' tools for 'real' work. I camp with the latter group..... but I digress. If wrapping only is your choice then an easy way to ensure individual success is to use a stocking at this stage. Place a ball in the toe of a stocking. Pull it tightly over the ball and secure with a bit of yarn. Use a different colour for each child/ or combination of colours. Tie another bit of yarn to the stocking about an inch along. Cut between the two. This gives you a new 'toe' to stuff another ball into. Do this for each child. Now we are ready for the messy fun bit. I like to sit the children in a circle around a large bowl of warm (not hot) soapy water. The water should feel slippery when you rub your fingers together in it. I like to use liquid Castille soap (Dr Brenners is good). But you can use a bar of nice handmade soap just dip it and roll it around in your hands until the water feels slippery and then remove the bar. You can use liquid dish soap - there are some nice organic ones. Just don't use detergent. They dip their ball in the bowl and begin to roll it around in their palms. While they are doing this I tell a story. Often it is about little mice who have gotten themselves quite dirty and need to dip in the 'bath' and be rubbed vigorously. Sometimes I make up rhymes that involve rubbing and rolling tossing (to the person opposite you in the circle) and throwing (two people to the left) --- you get the idea. When the balls have formed a good skin the wool will begin to poke through the stockings. Shortly after this happens the stockings must be removed or they will be part of the ball forever. Return the balls to their rightful owners -- remember those coloured bits of yarn --- they'll make this easier to do. I usually integrate this step into my story as there will be more felting to do. Cut the yarn off and the peel off the stocking. The kids can now see what their ball looks like. 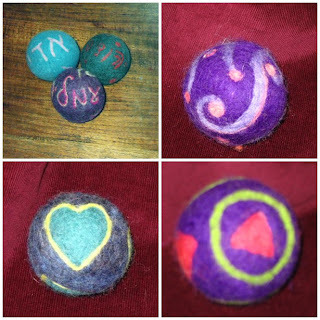 Once the kids have seen them and can recognize their own work you can resume felting. At this stage it is often helpful to dip less in the water but to add soap to the children's hands directly to keep them nice and slippery. You are done when the balls are well felted and everyone's hands are squeaky clean. Now exchange the soapy water in the bowl for water with a bit of vinegar in it. This will remove the soap and restore the natural acidic ph to the wool. Do this with fresh bowls until now more soap comes out. Twice usually suffices. These are really cool! Now I have to find your other blog, I need to go back to my emails! Commented on the post below this as well. thank you for this, i would love to try felting with a class of children. jox- I hope you do it! It's loads of fun and very rewarding.